Noodle: wheat flour, palm oil, starch (E1420), salt, wheat gluten, raising agents (E501, E500), antioxidant (E339), emulsifiers (E452, E450), soy protein isolate, emulsifiers (E466, E415, E401, E425), corn starch, whole egg powder, colors (E164, E101). 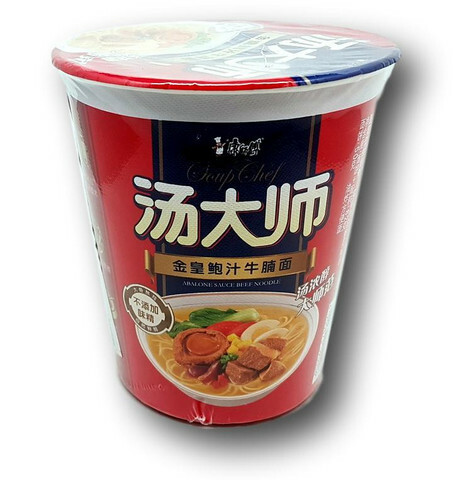 Soup: beef bone sauce, palm oil, soy sauce, lard, pork sauce, beef sauce, sweet bean sauce, tomato sauce, yeast extract, butter, chicken oil, seafood seasoning, seasoning, oyster sauce, sesame oil, salt, sugar, cabbage extract powder, seafood sauce, flavoring, maltodextrine, emulsifier (E415), flavor enhancer (E635), spices, color (E150a). 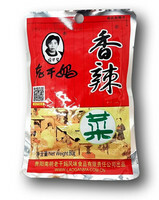 Dried vegetables: dehydrated meat, vegetable, green bean, goji berry, dried egg, onion. 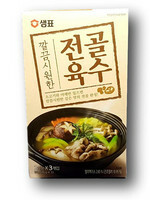 Contains wheat, soy, sesame, egg, milk, molluscs and crustaceans.